I am a little embarrassed to admit that I made my first adult trip to a farmer's market this summer. The fact that I hadn't been to one since I was a small child led to some pretty unrealistic expectations. In my imagination there were stalls as far as the eye could see, filled with a dizzying array of fresh fruits and vegetables. I was obviously living in denial, since I knew that the farmer's market was in a Best Buy parking lot. As you can probably guess, I was a little disappointed when I saw four small stalls, all of which were missing the purple carrots and fresh cranberry beans of my fantasies. After the initial disappointment wore off and I came back to reality, I appreciated the fact that there actually was a rather sizable selection of fresh, local produce that I wouldn't be able to pick up at the supermarket. There weren't any purple carrots, but I did find some purple bell peppers, cute green heirloom tomatoes, a basket of zucchini, fresh beets, and some blackberries that made their way into a delicious crumb cake. Also, at one of the stalls, next to the zucchini and yellow squash, I saw some squash that were a bit of a mystery to me. I had eaten tiny yellow and green pattypan squash once before, but these were bigger and a very pale green. Since I am a big fan of summer squash I bought a small basket and headed home to start googling. 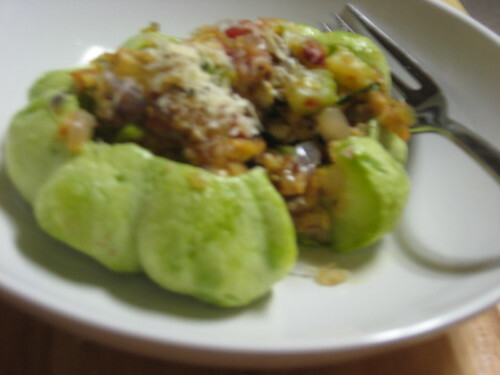 With a bit of internet research I found out that I had another type of pattypan, also called scallop, squash. 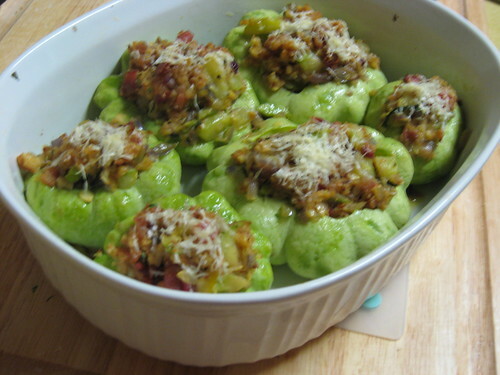 In my searching I came across a recipe for stuffed pattypans on Allrecipes.com that involved bacon and parmesan, and I knew immediately what was to become of my scallop squash. This recipe came together very easily, and I felt quite virtuous for using my local squash and pepper, but the filling was by far the best part of the dish. The smoky bacon and salty bite of the cheese was a nice contrast to the sweetness of the shallots and bell pepper. I liked the scalloped shape of the squash and appreciated the novelty of eating something new, but the actual squash had a slightly bitter taste to me. Next time I will probably take the same filling and stuff some halved zucchini. Zucchini is easier to find, and the length of the vegetable will provide more surface area for the stuffing to develop a crust. Preheat oven to 350 degrees. Fill a wide, shallow pan with one inch of water, and bring to a boil over medium-high heat. Add squash, cover, and cook about 10 minutes, until the squash is easily pierced with a fork. Drain squash and set aside until cool enough to handle. Slice off the top stem and scoop out the innards; coarsely chop and reserve for filling. Cook bacon until crisp (I use the same pan - fewer dishes), and remove with a slotted spoon to a paper towel lined plate. Poor off most of the fat, then add the onion and bell pepper and saute over medium heat until softened. Add garlic and cook about 1 minute, stirring. Stir in the reserved squash innards and continue cooking another minute. Remove pan from heat and stir in bread crumbs, cheese, and basil. Season to taste with salt and pepper. 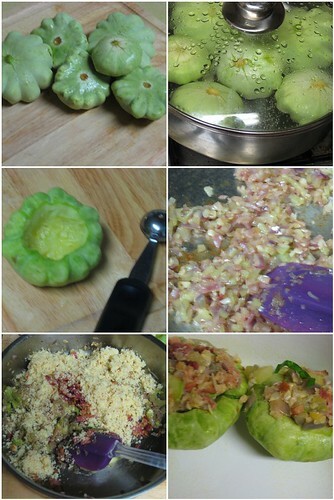 Add filling to hollowed-out squash, mounding the stuffing, and place in a baking dish. Top each with a bit of grated cheese. Bake 15 to 20 minutes, until the squash are heated through and the topping is golden.